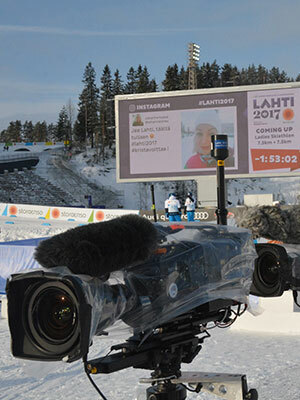 Wireless camera transmitters deliver flexibility to the broadcaster or content producer. With a wireless camera, broadcasters can go anywhere without trailing wires behind them, which can be a safety risk or prevent a camera from getting the shot. Wireless cameras offer the freedom to seek out new creative perspectives and get in amongst the crowd without having to install complex infrastructure. It also enables camera operators to repurpose a camera very quickly from one location to another. Production teams are searching for new ways to fulfil the consumer desire for a more personalized point of view. Viewers want interesting point of view shots or close ups, which is where 4K and HDR video quality come in as well. Both 4K and HDR give users the ability to mimic much more closely the capability of the human visual system and allows content producers to showcase more realistic views. Many major broadcast event teams are taking an active interest in the next step up in video quality — 4K, 4K + HDR and HD + HDR. Video compression technology is the key enabler for wireless cameras. Compression provides the ability to reduce the raw data rate of the camera and deliver high-quality video within the bandwidth restrictions of international frequency band allocations, but there are compromises to be made. Bit rate and bandwidth usage affects picture quality, but end-to-end latency should also be taken into consideration. A wireless camera is required to match the latency of wired cameras in order to cut seamlessly between views. For wireless camera technology, there needs to be a good balance of low latency, efficient use of bit rate and delivering video quality that compares to that of wired studio cameras. Premium video quality comes not solely from throwing more bit rate at the application. Smart choices in video compression profiles and understanding the downstream video ecosystem are key. Produced video content from an event passes through many stages before reaching the consumer — from event producer to content distribution service provider, to consumer platform operator, each stage will involve a video compression system that will impact the end video quality. Although 4K content is becoming more popular, there is an increased cost to producing it that most broadcasters and producers are considering. Producers would ideally shoot 4K content in a different way than how HD content is shot, including more wide-angle views where the viewer is encouraged to simply focus their attention on an area of the screen where the action is taking place and is comfortable doing so because the native resolution is there. Some have considered if this should lead to two production teams at a live event — one producing for HD and another for 4K - but economics of production costs play a role too. There is also the infrastructure cost to consider. The raw data rate of 4K is 12Gbit/s, which is four times that of 1080p HD and eight times that of 1080i. For many broadcasters, a change to 4K could force re-wiring of a broadcast center – potentially to an all IP environment to handle the new format – having to invest quite a bit in the up-front expenditure. Then, the broadcaster also has the cost of delivering higher bit rate to viewers’ homes. Currently, platform operators are running 4K channels at two to three times the bit rate of HD channels and that means carriage costs are two to three times that of HD channels. Viewing statistics show that 4K TV is not yet dominant in most people’s homes. Sports and movie channels are leading the charge, where there is a strong history of consumers paying top-dollar to view quality content. In general, for many, despite the obvious picture quality improvement and the drive from the consumer electronics industry, the argument to trigger a mass consumer refresh has not yet been won. Waiting in the wings is newer technology like HDR. Industry professionals now foresee a different way to affordably produce and transmit high-impact video — HD HDR. HD HDR has a lower price barrier of entry for broadcasters because with 4K, networks might have to change equipment entirely whereas with HDR, broadcasters might already have some equipment that is capable of processing these signals. HD HDR is, at most viewing distances, nearly as compelling as 4K HDR video and can be delivered to the consumer for a similar cost to today’s standard HD content. It could be that while movies, sports and high value drama channels are offered in 4K HDR, that next generation viewing experience comes to many in the form of HD HDR. Within the rapidly evolving market of television, many channel operators are already fixing their choices of what their future playout format will be. But for content originators who may serve and produce programming for multiple channel operators the good business decisions are backing the flexibility to serve all scenarios - be that traditional HD, HD HDR, 4K or 4K HDR. A high-end wireless camera transmitter, such as IMT Vislink’s HCAM, that delivers high-quality video formats, including 4K, 4K HDR and HD HDR can be a valuable tool, especially as the format of choice is still evolving. Using a multi-format capable transmitter along with a low-latency receiver allows for unique angles to be captured in the field, as it enables the content producer to switch between a wireless camera and a line camera with seamless transitions. 4K, HD and HD HDR wireless cameras deliver truly immersive viewing from any location, at a quality that matches wired studio cameras and with latencies that allow seamless production.